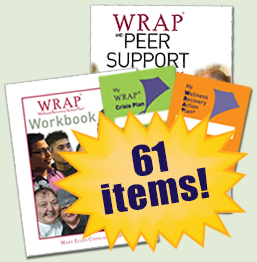 The Peer Group Bundle includes the WRAP and Peer Support Handbook, 20 WRAP Workbooks, 20 My WRAP and 20 My WRAP Crisis. The Peer Group Bundle provides great resources to share with support groups in one convenient bundle. If you bought the items individually they would cost $204.95. We bundle it together for only $184.50 – Buy the bundle and SAVE! This book is a compilation of information on WRAP and on Peer Support. It describes how these two strategies, which many people think are the gold standard for recovery, wellness and well being, can be enhanced by using them together.